• Suitable for use on grass and light scrub. Ideal for paddocks. • Single rotor with swinging tip blades. • Gear drive - no belts. • Over-run clutch on PTO shaft. • Large diameter rotor (300mm) with full length centre shaft. • Height adjustable large diameter rear roller with greasable and protected internal bearings. • Heavy Hammer flails fitted as standard. The flail design gives a good finish on fine or rough areas. • 6 drive belts with spring tensioner and cooling fan. • Spiral rotor system. The flails are mounted on the rotor in a spiral which reduces the power consumption and gives a better cut. 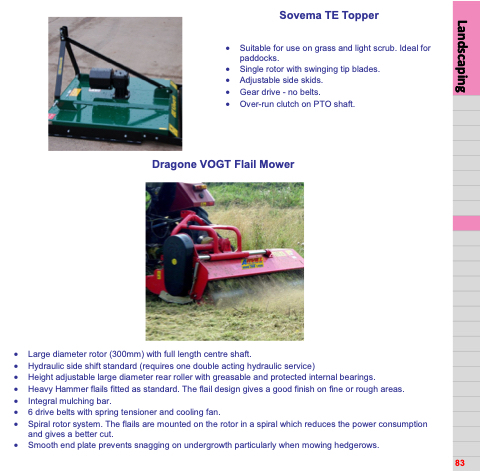 • Smooth end plate prevents snagging on undergrowth particularly when mowing hedgerows.